Paramount Fine Foods Group, a leading Arab Halal restaurant chain in Canada and North America, is gearing up to enter the Middle Eastern market, owing to a solid performance that attracted the attention of many Arab investors in the GCC region, and a number of other European countries. The strong and rapid growth witnessed by Paramount is evident in the quickly rising number of Paramount branches that exceeded 25 branches in Canada alone, in addition to other locations that are opening across the US, including the recent opening of Paramount’s first branch in Florida near Disneyland. Canadian Prime Minister Justin Trudeau praised the solid performance of Paramount and stressed the important role that enterprises can play in supporting and giving back communities in which they exist. “Their economic impact can be felt in terms of job opportunities they create, which in turn contributes to the well-being of our communities. Such enterprises also attract younger generations and immigrants wishing to preserve their identity by investing in feasible projects that not only represent an added value, but also promote multiculturalism, which is a source of pride to Canada; and enhance the role of national institutions in the field of corporate social responsibility,” said Trudeau. Mohamad Fakih, founder and chief executive officer, Paramount, noted that Paramount’s investments and franchise business is in full swing of expansion and goes beyond Canada and North America. “We are being approached by investors wishing to become Paramount franchisees and partners who wish to open their new branches in Gulf countries. 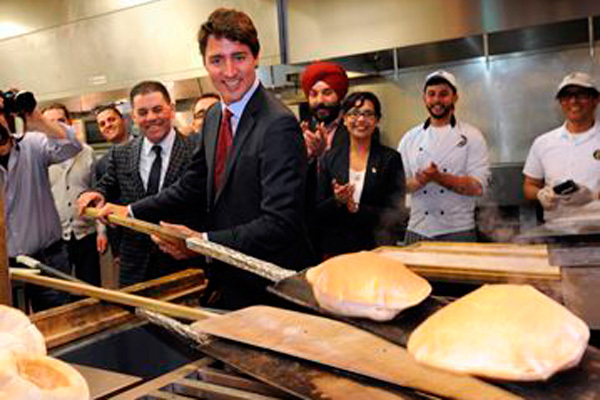 It wouldn’t be an exaggeration to say that many investors from Canada and outside of Canada are applying to be a Paramount franchisee, the fastest growing Halal restaurant chain in Canada and North America, a franchisee is Canada and North America means the investor who’s granted ‘the right to open a branch of a franchise and to be a franchisee,” he said. Paramount Butcher Shop, a halal butcher shop that specilises in halal deli products, halal meat and halal food, offers halal meats, poultry and deli, and customers do not smell certain odours found in other stores, said Faikh. A leading company has been commisioned to install cutting-edge atmosphere recycling and purification systems, whereas the shop is designed in a way to absorb and process any smell of meat. Another leading Paramount Halal brands is the ‘Fresh East’ sandwich shop brand, which has earned great confidence since it was launched in Toronto, Canada’s business and financial capital. This new brand provides freshest local ingredients, including hormone-free meats, high-quality produce, breads and other ingredients offering a healthy alternative that takes into account for athletes or people on diet. It is also suitable for students and company employees across Toronto. Paramount has set forth a set of criteria for the selection of partners wishing to become Paramount restaurant franchisees. The criteria allow everyone to receive a fair share of the gains, in the sense that the partner who contracts the franchise rights to open a Paramount branch should never feel exploited because he works hard to maintain the brand’s reputation, while the owner of the chain takes the bulk of the gains.